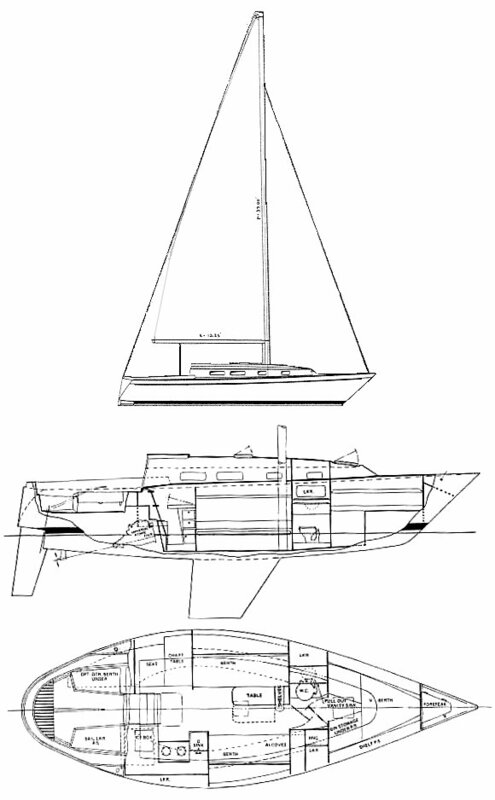 In 1977 Bill Shaw further increased the versatility of the Pearson line with the Pearson 31 Sloop. This original P31 design combined the latest thinking in a go-fast hull configuration with a manageable 7/8'ths fractional rig to take advantage of IOR racing rules, while still providing comfortable accomodations. It was produced as the first P31 design from 1977 to 1978 with 65 boats built. This hull was redesigned as the Pearson 32 in 1979 with a masthead rig and larger cockpit. That design no longer met IOR rules and was in production until 1982. *approximate by Pearson Yachts Inc. The Pearson 31 was a fun boat to design. All boats are fun, but this one represented a real challenge. What I wanted was a contemporary hull rig that would race well under a variety of rules, be simple to handle and still provide her owners with most of the comforts associated with cruising. In short, an up-to-date dual purpose boat with a great degree of versatility. For those intent on racing performance, she would react admirably; and for those who prefer the pure delight of cruising, she should deliver most of the comforts of home. There’s no question that a contemporary hull can go faster if her accommodations resemble a giant sail bin that doubles as a place to get out of the weather or to grab a sandwich between tacks. But, An honest dual purpose has got to perform both over the course and belowdecks. Therein lies the challenge. The new 31 has met the confrontation head-on and won in all respects. She is fast, a delight to maneuver, luxurious belowdecks has proven her versatility by winning trophies under three widely divergent rating rules. Her non-masthead rig makes headsail handling a cinch at no sacrifice to area; is more adaptable to changes in wind velocity; reduces the cost of genoas, and provides a lower rating under many rules. Interestingly enough, recent testing indicates that this lower rating is non-commensurate with an equivalent loss in speed. Belowdecks the 31 has 5 full length berths (6 optional), an aft galley, fold-away drop leaf table, an enclosed head and a luxurious teak interior that makes apres race that much more delightful. So if your plans call for getting the attention of the fleet at your home club or association (and you 1st Mate) and doing it in a comfortable cruising boat of Pearson quality. The new Pearson 31 was designed for the sailor who thinks winning races in a skinned out racing machine is a hollow victory. She’s the boat that gives you the ability to win comfortably, without being a financial loser. In an era of bare bones racing machines that tend to lose their value as fast as they are sailed, the Pearson 31 promises you speed along with comfort and luxury…at a price that’s as sensible as the idea behind her design. Two important advantages of the 7/8ths rig : a significantly lower rating under many rules for the racer, and easier sail handling for the cruiser. A lot of thought went into designing the T-shaped cockpit. Note how it lets the crew pass easily on either side of the wheel…without disturbing the helmsman. Any navigator is always more comfortable knowing where he’s going. He’s especially comfortable on the 31. In the 31, the pleasure of sailing hasn’t taken precedence over the joy of cooking. This U-shaped galley will please even the most ambitious on-board chef. For the enthusiastic sailor, boat speed intensifies the pure pleasure of sailing. To command the attention of your associates through a unique combination of performance both above and below decks is a satisfaction all its own. 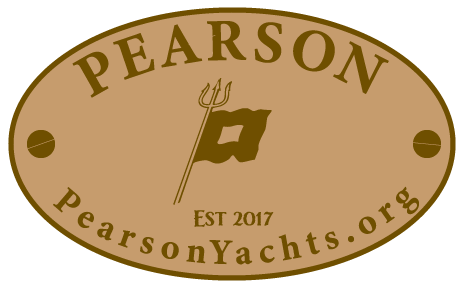 The Pearson 31 delights in this dual purpose. In a sense Bill Shaw’s Pearson 31 is two different boats. Beneath the surface of the water she’s hydrodynamically contemporary, revealing today’s latest design innovations. Inside, she’s a roomy luxurious yacht built with typical Pearson attention to quality. 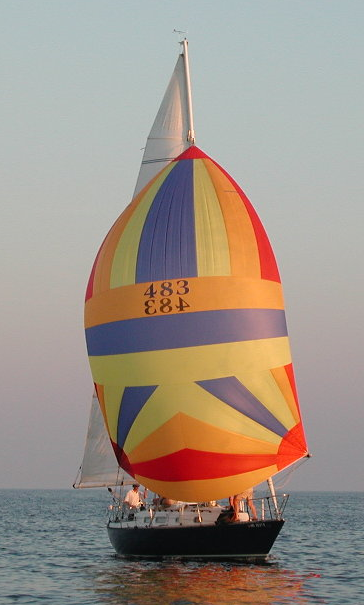 The 31 sails beautifully, but that’s only half the fun. A main salon like this is what makes arriving at a distant anchorage worthwhile. The athwartships toilet room features pullout vanity; privacy doors, hanging locker and stowage alcoves. Gear stowage above and below the berth, a V-filler that makes into a seat, and a privacy door…all make the forward cabin very comfortable. Recipe for fun: mix one brisk day and a new Pearson 31 together. Enjoy to the fullest. For the sailor who likes to cruise, race, or do both, the Pearson 31 has a winning way about her.